Sendetermin / Feb 24,2015 22:45 uhr am BR! Sendetermin / Mai 21 am NDR! So what if it's a week-night! Tell your friends and family, set your video-recorders, or just zap on by! 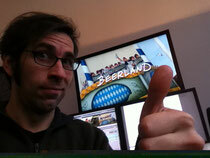 "Beerland" is playing again on TV on NDR at Midnight (0:00Uhr-1:25Uhr) for all you beer-lovers everwhere! Hallo! It sure has been a busy year, and as promised I have been hard at work exploring the fascinating world of German beer culture! Now the time has come to share it with my fellow Beerlanders. A year ago "Beerland" the film played throughout the cinemas, where I promised fans to keep uncovering more fascinating stories, and even sharing things that unfortunately never made it into the film. I realize that doing that requires your ongoing support, and not just to pay for my beer money ;) Check out my new upcoming YouTube Webseries "Beerland diaries" launched on April 23rd, German Beer Day, Subscribe, and keep sharing your beerland with me. So if you feel like cheking-in on life in Beerland, pour yourself some golden liquid bread, relax, and come along for the ride! "Craft Beer wäre was für die Fortsetzung"
Der amerikanische Filmemacher Matt Sweetwood wollte ein deutsches Kulturgut erforschen: Bier. Der Film, der dabei heraus kam, “Beerland” ist ein höchst unterhaltsames Roadmovie über Menschen, die auf Bierkästen um die Wette fahren und sich bei jedem ”Prost” tief in die Augen schauen. Schön. Lustig. Und gemütlich. Aber passt dazu die neu entstehende Craft Beer-Kultur?